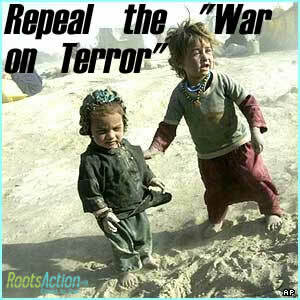 Repeal the "War on Terror" Repeal the "War on Terror"
Repeal the "War on Terror"
After more than 11 years the Authorization for Use of Military Force -- the congressional resolution that launched the "war on terror" -- has not been repealed. Congresswoman Barbara Lee has introduced a bill to repeal it. Please ask your Representative to co-sponsor and your Senators to do the same below. If you're not from the United States, click here to sign our petition. The next screen you get to will include video of Rep. Lee's prescient and powerful remarks in 2001.